Thanks to Barnes & Noble, there are now a slew of 7-inch, $200 Android tablets to choose from. 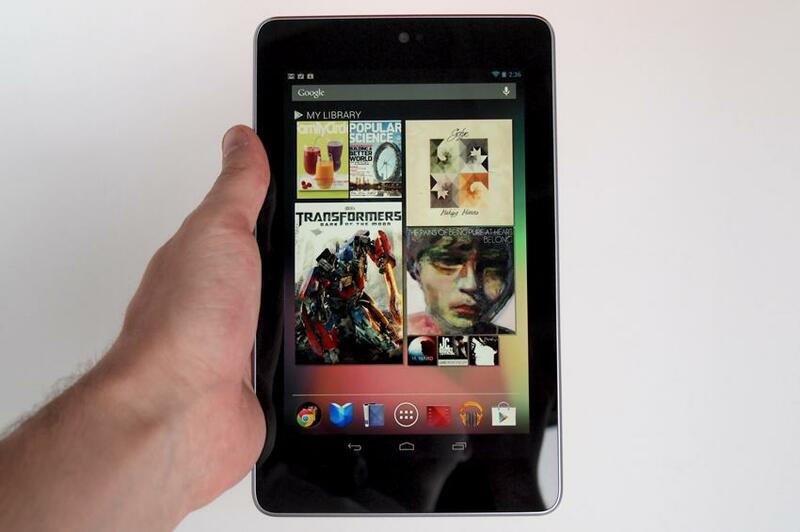 But ever since the Google Nexus 7 came into the world last year, it’s been hailed as the best of them. Unlike the Nook or Kindle tablets, the Nexus 7 runs pure, golden Android and gives owners access to the largest and still best selection of apps for the platform. While B&N spent their time touting the Nook’s suitability for e-book lovers and Amazon spent their time riding on the wave of just being Amazon (while pushing ads at you), dark horse e-bookseller Kobo took its time creating a tablet that borrows from the philosophies of its competitors. The $200 Kobo Arc is also for the e-book lover, yet it’s not restricted to one company’s content. Like the Nexus 7, you can install any app, sideload your own content, and even load up the competition’s apps. Plus it features a well-designed UI. But can the Kobo Arc stand up to the alpha tablet? Read our in-depth comparison to find out. Most important element of any tablet is the display. 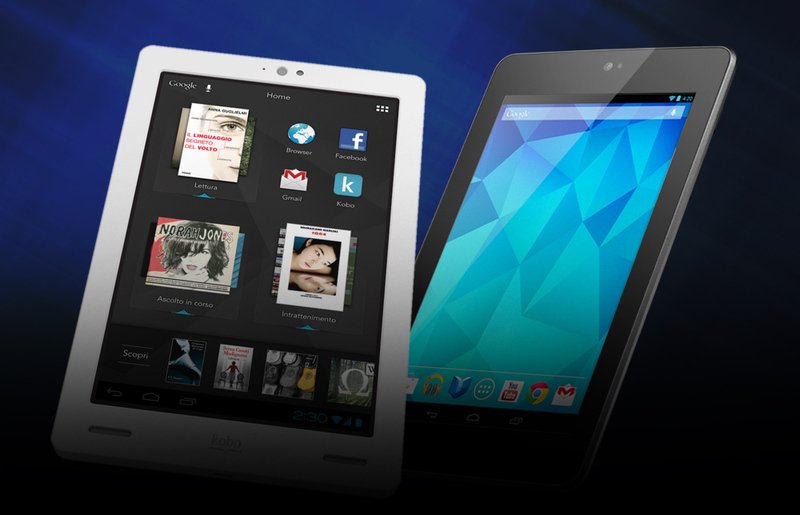 Both the Nexus 7 and the Kobo Arc have 7-inch, 1280 x 800 IPS displays. Both screens are bright, colorful, and responsive with wide viewing angles. Side by side, there’s no discernible difference between them. The Nexus 7 pulls ahead thanks to better fingerprint resistance. The Kobo Arc requires de-smudging daily. This is where you start to see real differences between these tablets. The Nexus 7 has a plain and unassuming design that doesn’t stand out from other tablets, nor does it need to. The soft-touch back and tapered edges make it comfortable to hold, as does the light 340g weight. The all-Gorilla Glass front pulls focus where it belongs: the display. The Nexus 7’s speakers sit on the back of the device, which isn’t ideal, especially since they get muffled if you rest the tablet on a soft surface. The Kobo Arc’s speakers face front and get plenty loud. The audio quality isn’t great, but it’s good enough for watching and sharing Web video. The design of the Arc is more attention-getting than the Nexus because it’s more in line with Kobo’s design for their e-readers than tablet design in general. That’s okay since there are nice aspects to it. The plastic bezel around the display means you have a place to rest your thumbs that isn’t glass – useful since the screen collects fingerprints so easily. The recessed display is less prone to cracking if the tablet lands face down since the screen won’t come in contact with the floor. Though almost the same size as the Nexus, the Arc is a little heavier at 364g. It’s still light and comfortable to hold thanks to a curved back, but the flat edges aren’t as pleasant at the Nexus 7’s tapered ones. Android is a very malleable operating system, which is why tablets like the Nook HD and Kindle Fire HD can look so different from other Android tablets when the software underneath is essentially the same. The Nexus 7 represents Android as Google intended it. Pure, unadulterated, and sleek. 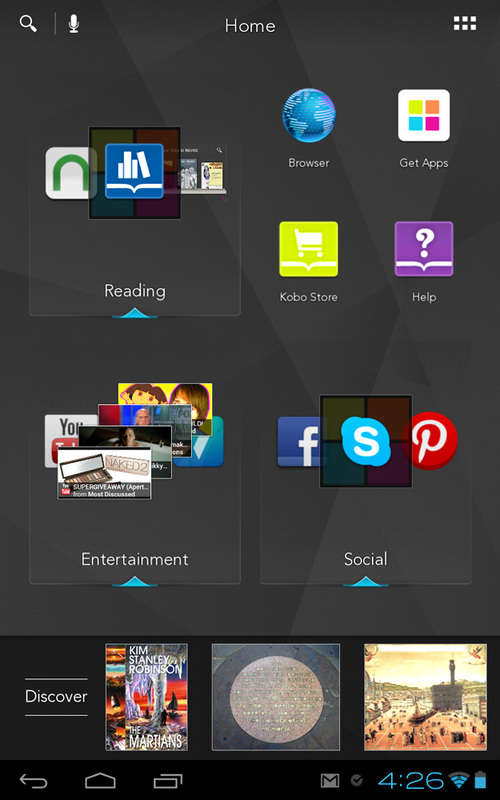 For the Arc, Kobo created an extensive user interface to go on top of Android, much as B&N and Amazon did for their tablets. There are pros and cons to both approaches. Right now, the Kobo Arc now runs Android 4.2 Jelly Bean, same as the Nexus 7. When the tablet launched, it came with Android 4.0 Ice Cream Sandwich even though Jelly Bean has been available for months. The (completely justified) worry that some customers have with custom interfaces is that the device won’t get updated to the latest Android in a timely manner, if at all. Whereas the Nexus 7 will be updated, without a doubt, until the hardware can no longer support the software. Android 4.2’s interface is a big improvement on past efforts, but Kobo’s user interface, called Tapestries, is much more user friendly for the less tech savvy and fun to interact with for those who know their way around Android. Tapestries turns the Home screen into a pin board for all the things you’re interested in: apps, books, websites, pictures, movies, music, everything. You can pin all of these things to the main screen or collect them in content-rich folders. The more you pin, the better the Discovery engine at the bottom of the screen gets. This area suggests books (from Kobo, of course) websites, media and more based on the tapestries you create. Click over to the Kobo Arc review for more in-depth impressions. In the ways that matter, the Arc works just like the Nexus. There are no restrictions on apps and you can download them (along with video, books, magazines, music, etc.) from the Google Play Store. 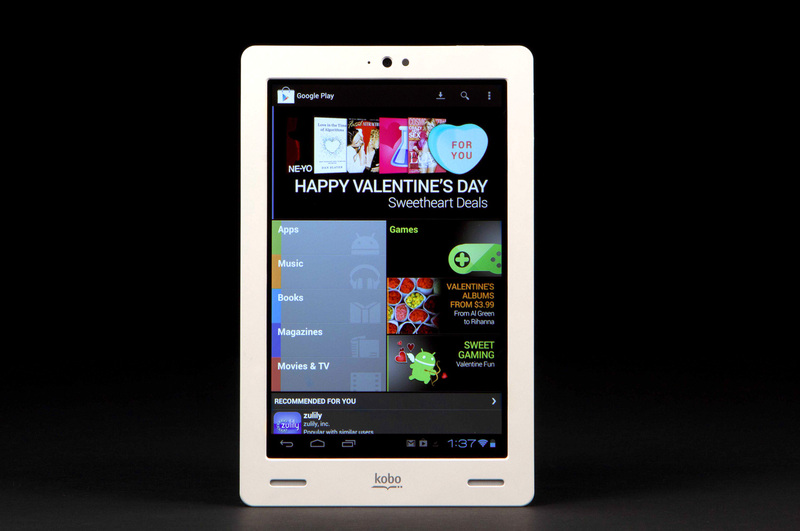 The Kobo Arc offers a more intimate way to interact with and personalize Android. If that doesn’t appeal to you, the Nexus 7 is there for your stock Android needs. The biggest difference between the two tablets is the processor. 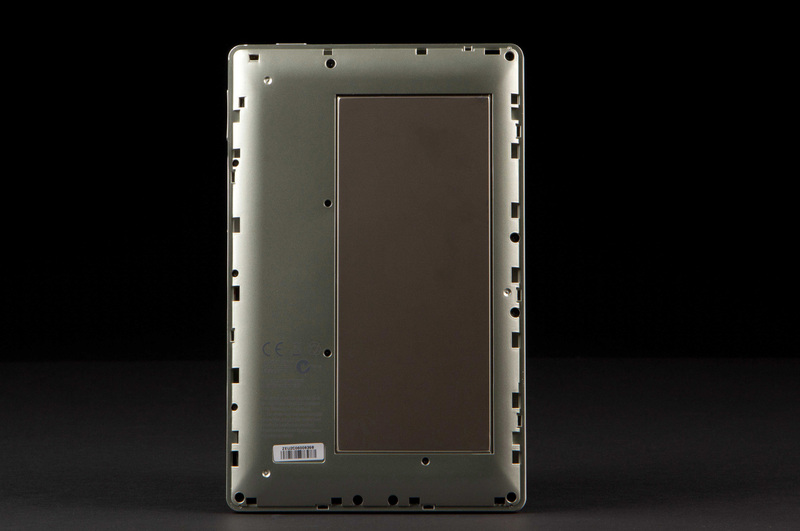 The Nexus 7 boasts a quad-core Nvidia Tegra 3 chip whereas the Kobo Arc has a dual-core TI OMAP 4470 processor. In general usage, both tablets perform well and offer fast performance. Where Tegra 3 gives the Nexus the advantage is games. There are several graphically intense games made to work with Tegra 3 that won’t run as well on the Kobo Arc. When it comes to more casual games like Fruit Ninja, Temple Run 2, and Angry Birds, there’s little difference between them. Video performance on both is on a par, even when watching HD clips. Both tablets have 1.2-megapixel front-facing cameras and no rear camera. Both are good enough for video chats, though neither camera is impressive. The Kobo Arc’s roots as a paired down tablet in the vein of the Nook HD shows in this category the most. Other than Wi-Fi, the Arc has no other wireless radios. No Bluetooth, no GPS, no NFC, no mobile data. Depending on how you use the tablet, the absence of some of these radios won’t make much of a difference. The lack of Bluetooth is surprising given that the Arc does make a decent multimedia machine. If you want more connectivity options, the Nexus 7 is for you. It does have Bluetooth, GPS, and NFC in addition to Wi-Fi. Some models also include mobile data connections to 3G and HSPA+ networks. Both tablets have micro USB ports for charging or connecting to a computer. Both Google and Kobo claim 9 – 10 hours of battery life for their respective tablets. In reality, we’ve been able to get 8 – 9 hours out of each with mixed use. Both the Nexus and the Arc are good at sipping power when in standby. If pure Android is important to you, then the Nexus 7 is the obvious choice. Likewise if gaming is your thing and you want the most powerful processor that works with the best titles. If neither of those aspects are that important, the Kobo Arc has manifest charms, mainly in interface. Despite the lack of many radios, the Arc is a compelling alternative to the Nexus. Which of these 7-inch, $200 tablets appeals more to you?